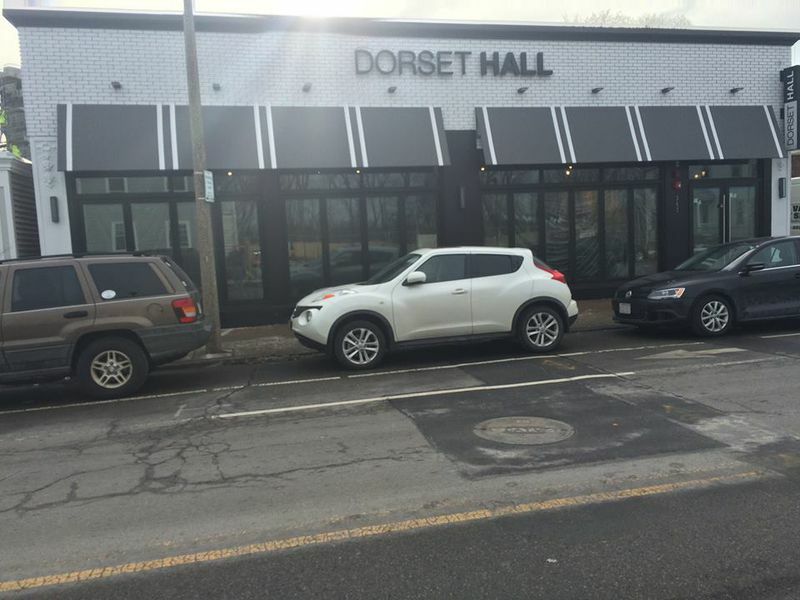 Much too hot to cook dinner last night, so we decided to try Dorset Hall, a fairly new addition to our neighborhood. First the good news: My salad was crisp, fresh, and huge. Barbara’s steak tips were medium rare (as ordered), accompanied by satisfactory mashed potatoes and broccoli that wasn’t overcooked. Clientele was diverse. Bathrooms were clean and spacious. There were two bars, which some might consider to be features, although they struck me as bugs. My hot roast-beef-and-brie sandwich was adequate. Now the bad news: As you can tell from the picture, the architecture is not exactly welcoming, and there isn’t much on-street parking. (We actually snared one of those spaces right in front, where that white car is, so we didn’t have to jay-walk across the street to the parking lot.) There were no wastebaskets in the men’s room! (There were in the women’s.) The roast beef in the sandwich was unfortunately well-done, probably because it had been heated; the “caramelized onions” on it were OK, although they weren’t caramelized. There were far too many televisions (though they were on mute, and I have to admit that the entire place was quite quiet, even though it resembled a sports bar). The four silly onion rings on Barbara’s steak tips were marginally OK — at least they were made from whole onions — but the batter was far too thick and they weren’t fresh. The wine list was very weak, featuring far too much CK Mondavi (which they might have confused with Robert Mondavi); we did find one decent California Cabernet. Prices would have been reasonable for a better dinner, but they were too high for what we got. So, as I said, meh. We’ll go back to Ashmont Grill next time. ‹ What!? We’re making fun of Comic Sans yet again?? ?